UCP Leader Jason Kenney laid out his plans Tuesday for stopping what he described as an "assault" on Alberta's oil-and-gas industry by NDP Leader Rachel Notley and Prime Minister Justin Trudeau. UCP Leader Jason Kenney laid out his plans Tuesday for stopping what he described as an "assault" on Alberta's oil-and-gas industry by NDP Leader Rachel Notley and Prime Minister Justin Trudeau, including telling Ottawa that Alberta's equalization payments will stop unless pipelines are built. 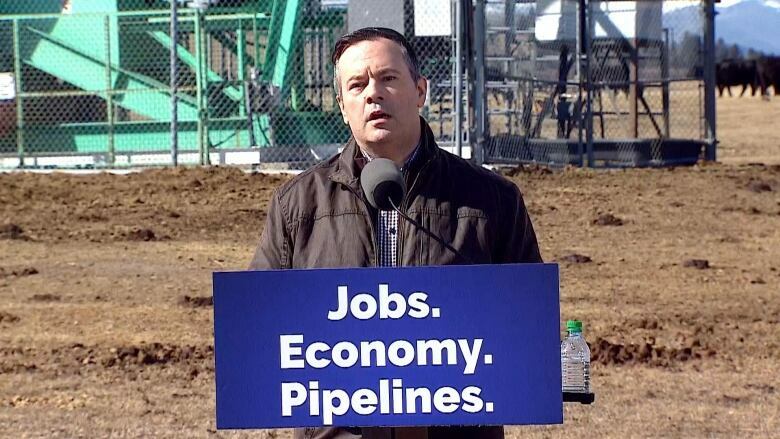 "The centrepiece of our platform is fighting back against the foreign-funded special interests and the Trudeau-Notley alliance that have landlocked our energy," Kenney said, addressing media in front of a pumpjack near Turner Valley in southern Alberta. Making alliances with pro-pipeline provincial governments. Challenging the charitable status of organizations like the Suzuki Foundation. Supporting an effort to sue organizations like Greenpeace for "defamation" against the energy industry. Telling Ottawa that no pipelines means no equalization. Firing a former Pembina Institute director from the board of the Alberta Energy Regulator (AER). Some of those promises might prove easier than others. The Alberta government is in charge of appointments to the AER board, but it has no say over the federal equalization program, which is outlined in the constitution. The UCP leader said he chose the location for the news conference strategically, speaking just kilometres from where oil was first discovered in the province. "The oil and gas sector in Alberta has always been the core of our prosperity … [but] we may be, thanks to the Trudeau-Notley alliance, in our second recession since the NDP took over," he said. Kenney criticized the oil production cap and said the NDP's actions while in government "recklessly" kicked off a "stampede" of investors fleeing the province. Notley said Tuesday in Calgary that Kenney's repeated suggestions that she is an accomplice of Trudeau are nothing more than political grandstanding. She said she has publicly voiced concerns with Trudeau over various issues, but said her working relationship with the prime minister helped when Ottawa bought the Trans Mountain pipeline project. Kenney was asked to respond to a Bloomberg article published Tuesday morning that said Alberta wildcatters — small producers that speculatively drill for oil — have benefited enormously from the curtailment. He said while he hasn't seen the article, he's seen a report that indicates only 45 per cent of Alberta rigs are currently in the field. "In 2014, it was more like 90 per cent. And by the way, Texas, for example, has something like 98 per cent of rigs that are currently in the field doing exploration," he said. "I haven't seen that article … but it doesn't conform to the actual hard data that is available." Top priorities for the UCP will include reforming the AER to speed up well approvals, guaranteeing in law the royalty regime in place when a well is drilled will be in place in perpetuity, and intervening in National Energy Board hearings, he said. Kenney also addressed complaints he's spent less time in Calgary than Edmonton so far during the campaign, saying that while the NDP may see the city as a key battleground, the UCP doesn't feel the same way. "We think the key battleground, quite frankly, is Edmonton. That's where we see the strongest competition. We don't take any part of the province for granted. Calgary has been hardest hit by the recession … if people want change to get Alberta back to work, they're not going to vote for the NDP," Kenney said.